African governments and IT players on the continent should aim at building and opening up e-Infrastructure and internet services so that they are affordable and easily accessible to users. 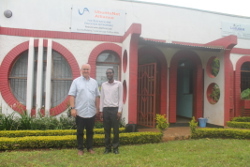 Jim Forster, a former 20 year employee of the world’s leading IT and Networking company Cisco Systems and now Chairman of NetworkTheWorld, made the suggestion in an exclusive with NUANCE when he visited the UbuntuNet Alliance Secretariat in Lilongwe in February, 2017 as part of his organisation’s long term vision to harness internet connectivity, accessibility and affordability in remote areas of Africa and Asia. “Users of the Internet in Africa continue to pay higher costs for bandwidth as compared to their counterparts in Europe or America. Although gradual improvements in lowering down these costs are being seen, we would like to see users paying as low as $2 pmbs per month for mobile broadband,” he said. Forster said one of the reasons contributing to the high cost of broadband is the reluctance of Infrastructure owners such as mobile phone service operators and government to open up their infrastructure to different players, a development he predicted would make the cost of providing broadband cheaper hence bringing down the cost. He said another way of leveraging bandwidth cost is by encouraging providers like mobile phone service providers to have fixed line and fiber connectivity adding governments need to introduce enabling policies that will make the internet affordable to providers and users. Commenting on the status of African universities in relation to broadband access, the NTW Chairperson challenged Research and Education Networks to offer their member institutions cutting edge added value services that can transform the continent’s research and networking capabilities making them more competitive. “The UbuntuNet Alliance model is an excellent model where universities and research institutions do not need to get their connectivity from mobile phone operators. However the most important thing is for the NRENs to offer their members universities excellent services that are not being offered by the other providers. The universities will have no choice but pay for these services,” he said. Currently, Forster is working on different projects aimed at getting the Internet to low income places in Africa and Asia and some of the organisations he is working with Include Air Jaldi in India and Mawingu Services in Kenya.